This past week a video went viral when a woman complained about the lengthy wait time at a clinic. On video, we see the physician asks if the patient still wants to be seen. The patient declines to be seen, yet complains patients should be informed they will not be seen in a timely manner. The frustrated physician replies, “Then fine…Get the hell out. Get your money and get the hell out.” While we do not witness events leading up to the argument between doctor and patient, we do know staff at the front desk called the police due to threats made by the patient to others. Based on the statement released by Peter Gallogly, MD, he is a humble, thoughtful, and compassionate physician who was very concerned for the safety of his staff, which he considers “family.” Physicians like Dr. Gallogly do their best to serve patients, ease their suffering, and avoid losing ourselves to burnout at the same time. Every human being deserves our compassion, kindness, and clemency. Patients and physicians must accommodate each other when possible. Do physicians actually deserve our mercy when necessary? Yes, they do. I should know. The kindness shown to me by my patients over the past month has been unparalleled, leaving this physician thankful beyond words. My father has been a practicing pediatrician in our community for 47 years. As I type these words, he is dying in a hospital bed. We have worked side by side for the last 16 years. It is difficult to make it through the day, desperately hoping to hear his voice one last time in the clinic hallway. He was carrying a full patient load before an unexpected cardiac arrest ended his career. The patient load doubled overnight; it is a burden I am carrying alone. Could OpenNotes Transform the Analytics Marketplace? Could OpenNotes help push predictive analytics from paternalism to partnership? At the recent Health 2.0 Annual Fall Conference, for example, companies like Cardinal Analytx Solutions and Base Health spoke of using machine learning to find those individuals among a client’s population who haven’t yet been expensively sick, but are likely to be so soon. Companies seeking to make that information actionable touted their use of behavioral theory to “optimize patient motivation and engagement” via bots, texting and other technological tools. Being able to stave off a significant amount of sickness would constitute extraordinary medical progress. Along the way, however, there’s a danger that an allegiance to algorithms will reinforce a paternalism we’ve only recently begun to shed. A thin line can separate engagement from enforcement, motivation from manipulation, and, sometimes, “This is for your own good” from “This is for my bottom line.” It is here where OpenNotes could play a critical role. In a recent article for The BMJ, I proposed a concept called “collaborative health” to describe a shifting constellation of relationships for maintaining wellbeing and for sickness care. Shaped by each individual’s life circumstances, these will sometimes involve the traditional care system, as “patient-centered care” does, but not always. Politico’s Arthur Allen has written a useful report on recent findings about EHR-related errors. We must keep in mind, however, that almost all EHR-related errors are unknown, and often unknowable. Why? The most common errors involved with EHRs are medication prescribing errors. But we seldom find those errors because those type of errors seldom manifest themselves because so many hospitalized patients are old and sick, have several co-morbidities and are taking many other medications. Key organs, like the liver, kidney and heart, are compromised. Bad things can happen to these patients even when we do everything right; conversely, good things can happen even when we do much wrong. We usually miss the results of, say, a wrongly prescribed medication. (Note: these types of ‘missed’ medication errors contrast to leaving a pair of hemostats in the gut or to wrong-site surgery—where most errors soon become obvious). As the experts referenced (Dr. Bob Wachter, Dean Sittig and Hardeep Singh) noted, very, very few cases make it to litigation, further reducing the numbers examined in the study discussed. Perhaps worse, few clinicians want to report problems even if they know about them. This is a litigious society and few medical professionals want to spend time in court. Also, as the authors Allen interviewed (all of them my friends and respected colleagues): some of the errors that were known did not result in harm and many were caught by others or by the professional involved in the error before they harmed. Some things never change. Joe Flower is one of those things. Pay attention. Joe was the keynote speaker at Health 2.0 Silicon Valley earlier this month. We’re excited to feature the text of his remarks as a post on the blog today. If you have questions for Joe, you can leave them the comment section. You’ll find a link to a complimentary copy of his report Healthcare 2027: at the end of this post. You should absolutely download and read it. And take notes. We are gathered here on holy ground, in Silicon Valley, the home of the startup, the temple of everything new, of the Brave New World. And healthcare? Healthcare is changing — consolidation, new technologies, political chaos, a vast and growing IT overburden, shifting rules, ever-rising costs, new solutions, business model experiments. what are the pictures in your head? Catastrophic system failure? The dawn of a bright new day of better, stronger, cheaper healthcare for everyone, led by tech? Do we have all the confidence of a little girl screaming down a slide? Do we just say in denial about the future and end up in a kind of chaotic muddling along? There’s a debate in the United States about whether the current measures of health care quality are adequate to support the movement away from fee-for-service toward value-based payment. Some providers advocate slowing or even halting payment reform efforts because they don’t believe that quality can be adequately measured to determine fair payment. Employers and other purchasers, however, strongly support the currently available quality measures used in payment reform efforts to reward higher-performing providers. So far, the Trump administration has not weighed in. Even imperfect measurement and transparency accelerate quality improvement. One set of measures often questioned is the Agency for Healthcare Research and Quality’s (AHRQ) Patient Safety Indicators (PSIs) used by the Centers for Medicare and Medicaid Services (CMS) and others in value-based payment programs. These indicators measure surgical complications and errors in hospitals, which is critical given that one in four hospital admissions is estimated to result in an adverse event. PSIs remain among the most evidence-based, well-tested, and validated quality measures available. 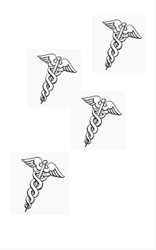 CMS uses many in its value-based purchasing programs. Use and reporting of PSIs through AHRQ’s Medicare Patient Safety Monitoring System has measurably improved quality. For instance, CMS reported a reduction in inpatient venous thromboembolisms (VTEs) from 28,000 in 2010 to 16,000 in 2014, meaning that 12,000 fewer patients had potentially fatal blood clots in 2014. In addition to using quality measures in payment programs and for quality improvement, making measures public is key to accelerating change. “If transparency were a medication, it would be a blockbuster,” concluded a multi-stakeholder roundtable convened by the National Patient Safety Foundation’s Lucian Leape Institute in 2015. The foundation’s report cited the Leapfrog Group’s first-ever reporting of early elective delivery rates by hospitals in 2010, which galvanized a cascade of efforts to curtail the problem and thus reduce maternal harms and neonatal intensive care unit (NICU) admissions. This was effective: The national mean of early elective deliveries declined from a rate of 17% to 2.8% in only five years. Year after year, Congress fails to reach consensus on important issues, the electorate screams for change, and voters become more polarized along party lines and ideology. These struggles aren’t causes of America’s political malaise, says Michael E. Porter, co-chair of the U.S. Competitiveness Project at Harvard Business School; they’re symptoms of a much larger problem. U.S. “democracy” is a weak, uncompetitive industry controlled by a duopoly that pursues private interests at the expense of public good. 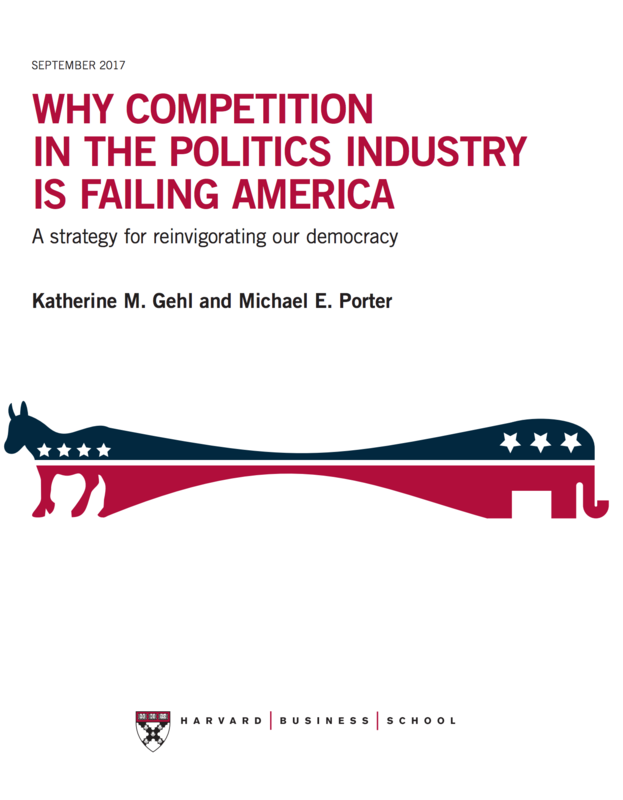 “To fix our political system, we must see politics as the major industry it has become, the major economic benefits it provides for its participants, and how today’s political competition is not serving the public interest,” as Porter explains in “Why Competition in the Politics Industry Is Failing America,” a just-released groundbreaking study co-authored with business leader and former CEO Katherine M. Gehl. Measured by these success factors alone, America’s system has already failed. But Porter and Gehl are adamant in their belief that we can recover our former sense of bipartisanship and dynamism. Read Porter’s and Gehl’s paper to learn more about their poignant perspective on our nation’s most urgent problems and how business, strategy and competition can help solve them. That was before the Affordable Care Act, before the Cubs won the World Series. Before anyone knelt for the national anthem, and if they had, people would’ve probably not minded. It was before the election of a reality TV star to our highest office, before “fake news” became a thing (there was plenty of it, but nobody called it that). It was before half of the rock legends died, before Anthony Wiener went to jail, back when Hamilton was a guy nobody knew much about who was on the 10 dollar bill, when the world wasn’t quite this warm, when Oprah hated me. Actually she still does. I’m not sure why. I left my old practice because of “irreconcilable differences” with my ex-partners. Instead of going to the VA, joining another practice, or moving to New Zealand, I started a different kind of practice. My Yoda, Dave Chase (who wrote a book that you MUST read) told me about “Direct Primary Care,” where doctors don’t charge a lot, but are able to see a lot of people and give good care because they are paid by their patients. It made sense to me. There were a few folks doing it, and I talked to a couple (I’m looking at you, Ryan) who made it sound possible. So I did it. I dumped all insurance and started charging people a flat monthly fee. People were skeptical and only my most loyal patients followed me (about 200). It took a while, but we figured out how to make it work, and my patients figured out that this was the best experience they ever had in healthcare. Is it “a breach of trust” for a publication to publish an opinion piece that was written with the participation of public relations professionals? That was the conclusion of a recent article in Health News Review, a publication that bills itself as “Your Health News Watchdog.”(“Another ‘breach of trust’ at STAT: patient who praised TV drug ads says pharma PR company asked her to write op-ed”). The article traces the origins of an op-ed that appeared in STAT, the respected medical blog published by the Boston Globe, headlined “You can complain about TV drug ads. They may have saved my life.” Health News Review managing editor Kevin Lomangino found that a public relations firm working for Gilead, a pharmaceutical company that makes the hepatitis C drug Harvoni, had reached out to a patient named Deborah Clark Duschane and asked her to write about her experience with drug ads. As a professional ghostwriter, who has been hired by public relations professionals to work with authors on op-eds that have run in respected publications, I disagree.